Most internet browsers have spell-checking enabled by default. This article will show you how to enable this feature for Google Chrome or Safari. In summary you need to ensure that your browser is using the correct English language. This will be English (American) if you are in the U.S.A, or it will be English (UK) if you are in New Zealand or Australia. 2. This opens up a dropdown menu. From that menu, click Settings. 3. This opens a new tab displaying your browser settings. Scroll to the "languages" section and click "Language and input settings..."
This will open a popup that lists the language(s) you have installed. The one you are using will be highlighted grey. 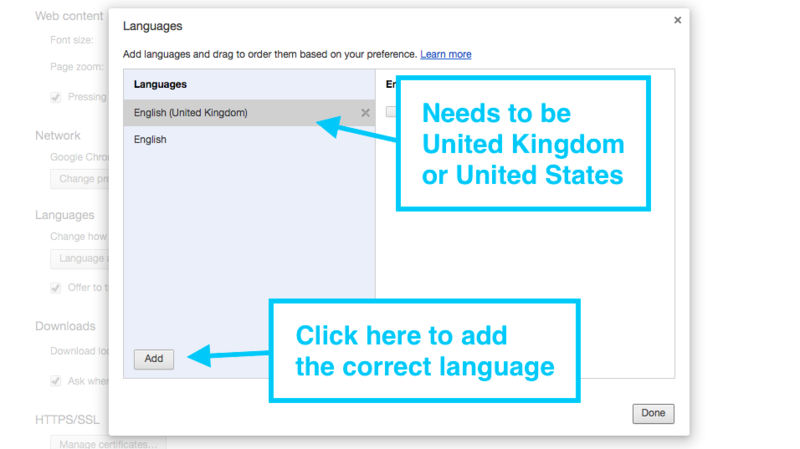 This needs to be English (United Kingdom) - as selected in the example below - or English (United States). This is because these two languages come with a built-in spell check. 5. If you do not have either option, click Add to add the one you need to use to your browser. 6. Once you've selected the correct language click Done in the bottom corner, and you're ready to go! Google Chrome will now automatically check your spelling as you type. Safari should automatically read the language your computer or laptop is using already. So you shouldn't need to set your language up. 1. Open Safari, then open the Edit menu from the top of the screen. 2. Find "Spelling and Grammar" and hover your cursor over it. 3. Ensure that "Check Spelling While Typing" is turned on (if it's turned on it will have a checkmark on it). Click the option to turn it on/off. Below is a screenshot of how my misspelt word looks with that setting turned on. Misspelt words have a red squiggly line underneath them. Right-click the misspelt word, and Safari will suggest the correct spelling for you. Click the correct suggestion to fix the typo.